Selecting text, data or objects is so commonly done that we don’t even think how it is ACTUALLY being done. As a result, many methods of selecting things are inefficient. Each time you may waste few seconds, but it adds up. Based upon what I have seen, I feel most of us waste at least 15 minutes a day because we don’t use the right method of selecting things. All of us know CTRL A selects the whole document. Unfortunately, we never try it elsewhere. Excel data : CTRL A selects contiguous block. Another CTRL A selects whole sheet. Excel Find Search Results: Selects all results. Ctrl Click can be used for unselecting individual items. 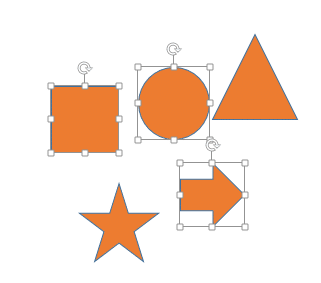 This is useful for shapes, pictures and other objects. 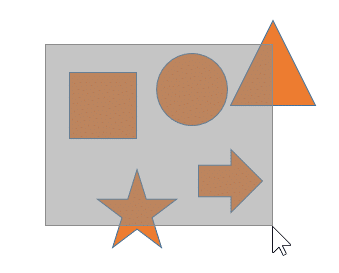 If there are multiple objects on a slide, Click somewhere outside any object and draw a rectangle by dragging the mouse. Any object which is completely inside the rectangle is selected. Ctrl Click for exception. This is useful for very long lists, long data, long portions of text, web pages etc. Start the selection at the beginning. But don’t try to drag the mouse all the way to the end, because it is very cumbersome. Let some small portion in the beginning be selected. Now scroll to the end point without clicking anywhere inside the document. Now press shift key and click at the end point. The entire intervening area from beginning to end will be selected. If you know the beginning and ending of the range, you can choose F5 (Go To) and type the range like A1:D1000 and click ok. If you have a name for the range or the table, you can type the name itself. You can open the dropdown near the name box to move to and highlight any named item. Double click selects a word. Triple click selects a paragraph in Word. Did you know that? If you are moving from place A to place B in the document by any method – page down, scroll, mouse scroll , whatever… and if the shift key is pressed, then it selects things. Try this out to understand what I mean. Make sure you have a block of data to try this out. Now press and release the END key. Now status bar shows END mode. What does this mean? Excel now knows that you want to move the selection from the current place to the end. But it still does not know end in which direction. So it is waiting for you to clarify that. That is called End Mode. Now you are supposed to guide Excel by just pressing and releasing up, down, right or left key. Then it will move to the end in that direction. Of course if Shift key was pressed all along then it will SELECT from original to final position. 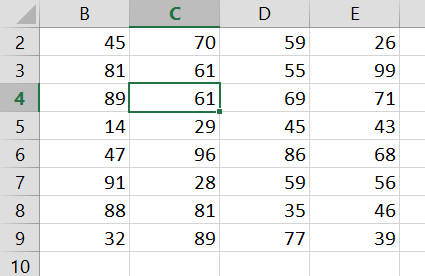 So if you want to select from current position (C4) to the end of the row, the exact sequence would be like this. Lot of convenient methods of selection are available using mouse. The best way is to create a table. Move the mouse cursor slowly and whenever it changes try a single or double click. Also try single or double click on the left side margin, just outside the table. Of course there are hundreds of other methods of selecting effectively. This article has shown some commonly useful ones. But keep on the lookout for situations where you are selecting something repetitively. That is the place where you have to find a faster method of selection. Try to explore. I am sure you will find a better way. If you cant, ask me.